hahahaha I know what you mean. Oh, they can do fine on bread and beer, I assure you. 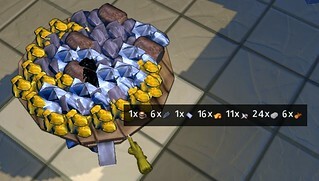 Yeah, each piece of gold is worth 1000 fishes! My rules! each gold worth 1000 fish? I like it! I'd suggest you make sure you keep the debugger running whenever you're playing the game, that way you'll be prepared for any sudden crashes. This is an alpha after all so sudden crashes are sort of part of the game at this point. (06-01-2014, 12:10 AM)Seriously Unserious Wrote: I'd suggest you make sure you keep the debugger running whenever you're playing the game, that way you'll be prepared for any sudden crashes. This is an alpha after all so sudden crashes are sort of part of the game at this point. Well, the way I see it, this is when your experimenting with new features and ways of doing things, pushing the envelope so to speak, so if mistakes are going to enter the code that trigger crashes and bugs, now's when they're going to happen. We are basically your testing team so it's partly our jobs to find those bugs and stop errors and give you as much data on them as possible so you can fix them. Current time: 22-04-2019, 12:26 PM Powered By MyBB, © 2002-2019 MyBB Group.